Applewood Plumbing Heating & Electric (www.ApplewoodFixIt.com) was honored as the 2009 Large Business winner in the Better Business Bureau, BBB Torch Award for Marketplace Trust on Thursday, Oct. 15, 2009 at the awards luncheon held at the Grand Hyatt in downtown Denver. The 7th Annual BBB Torch Awards celebrates outstanding businesses. 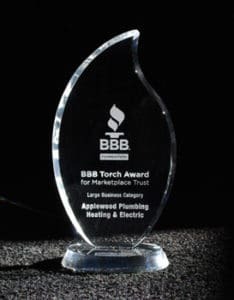 The winner of the Torch Award exemplifies the BBB’s mission “to be the leader in advancing marketplace trust.” The BBB recognized eight finalists from the small, large and nonprofit business sectors from more than 200 nominees. The three large business finalists included Applewood, Designs by Sundown and Elevations Credit Union. “I think businesses have an obligation to the communities they serve to ensure trust is at the foundation of their relationship,” said John Ward, founder of Applewood Plumbing Heating & Electric. “Any company who can maintain an A+ rating with the Better Business Bureau is an example of this kind of business ethic,” he said. These basic business principles and philosophies are modeled from the top leadership in every way. Ward’s interactions with employees, fellow peers, customers, vendors and the general community demonstrate the genuine sense of commitment he brings to all endeavors. The company was recently ranked eighth of more than 300 service businesses and received the Nexstar Select Service Award of Excellence, which is based upon customer, employee and financial success. This is the seventh year in a row Applewood has received the esteemed designation, which is based on customer, employee and financial performance. Applewood was also named the 2007 Golden Rotary’s Ethics in Business Award winner and the 2008 Best of Boulder Award in the Plumbing Contractors category by the U.S. Local Business Association (USLBA). And, Ward was named 2008 Businessperson of the Year by the Public Relations Society of America. Ward’s business approach is fulfilled daily in a number of ways, but the company’s “Caring Community 12 in 12 Giveaway” program represents their giving community spirit. Local nonprofits are awarded $1,000 monthly to support programs, community projects and educational activities. Applewood also supports the Wheat Ridge Farmers 5000, the Belmar Elementary Science Fair and the Denver Old Home Fair.